Genea-Musings: Amanuensis Monday -- 1692 Probate Record for Abigail Young (1628-1692) of Eastham, Mass. Amanuensis Monday -- 1692 Probate Record for Abigail Young (1628-1692) of Eastham, Mass. This week's document for Amanuensis Monday is from the Barnstable County, Massachusetts probate documents for Abigail (Howland) John Young (1628-1692) of Eastham, Massachusetts. sd Court to be Recorded. Henry: that was with in doors. when her head was Laid. "Massachusetts, Wills and Probate Records, 1635-1991," indexed database with digital images, Ancestry.com (http://www.ancestry.com, Barnstable County, "Vol. 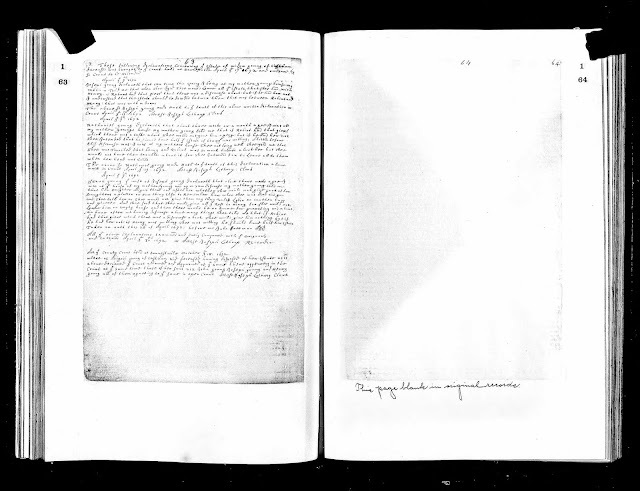 1-3, 1686-1747," Volume 1, page 63, Abigail Young probate papers. Abigail (Howland) Young died on 7 April 1692 in Eastham, Massachusetts, the widow of John Young (1624-1691). The three declarations above were made on 7 April, 9 April and 25 April, 1692. The conversations of the three declarants with Abigail Young were recent - within a month of her passing. At the time, Henry Young was age 20 and Robert Young was age 24, and neither was married. These records are, in essence, a nuncupative, or oral, will. I posted Amanuensis Monday -- 1688 Will and Inventory of John Young (1624-1691) of Eastham, Mass. last week. In his will, John Young named his six living sons - Henry, John, Joseph, Nathaniel, David and Robert Young, but did not name his three daughters by name (Mary, Abigail and Lydia). He left everything to his wife during her widowhood, but bequeathed land after her death to his sons. Son Henry was to received all of his housing and a piece of upland. In these three declarations, two sons and a daughter-in-law declare that Abigail Young, widow of John Young, stated that all the estate she had would go to her son Henry Young, unless son Robert Young "had her not" a "gierl" which, apparently, the family talked about. This causes the reader to question the meaning of "had" - was Robert disqualified if he had had sexual relations with her, or if he kept seeing her? In any event, Abigail stipulated that Henry had to agree to share the estate with his brother if he "had her not." The other issue was that daughter Abigail (Young) Twining asked for something to remember her mother by, but the mother Abigail declined and specified a platter and jug for daughter Lydia instead. I wonder if Lydia ever received it? The Court allowed and agreed with the declarations, but the outcome was not entered into the Court records. Henry Young died intestate in 1706 before most of his siblings - I found a letter of administration, an inventory of about £78, and an account for him, but nothing that described his real property. John and Abigail (Howland) Young are my 8th great-grandparents. I am descended from the eldest son, John Young (1649-1718) who married Ruth Cole (1651-1735) in 1671 in Eastham, Mass. This record does not appear to be indexed by Ancestry.com in their Massachusetts, Wills and Probate Records, 1635-1991 collection.